I love the truffles I made. Love biting into their velvety smooth texture. Too bad I did not have any liquor. If not, it would have tasted even better if I had added in a few tablespoons of cognag, brandy or rum. Scooped them into mis-shaped bite-sized balls and coat them before putting them back into the fridge until firm. I think both Min & I can finish the whole lot of 25 pcs in a day! Place the chopped chocolate in a medium sized stainless steel bowl. Set aside. Heat the cream and butter in a small saucepan over medium heat. Bring to a boil. Immediately pour the boiling cream over the chocolate and allow to stand for 5 minutes. Stir with a whisk until smooth. If desired, add the liqueur. Cover and place in the refrigerator until the truffle mixture is firm (this will take several hours or overnight). Place your coatings for the truffles on a plate. 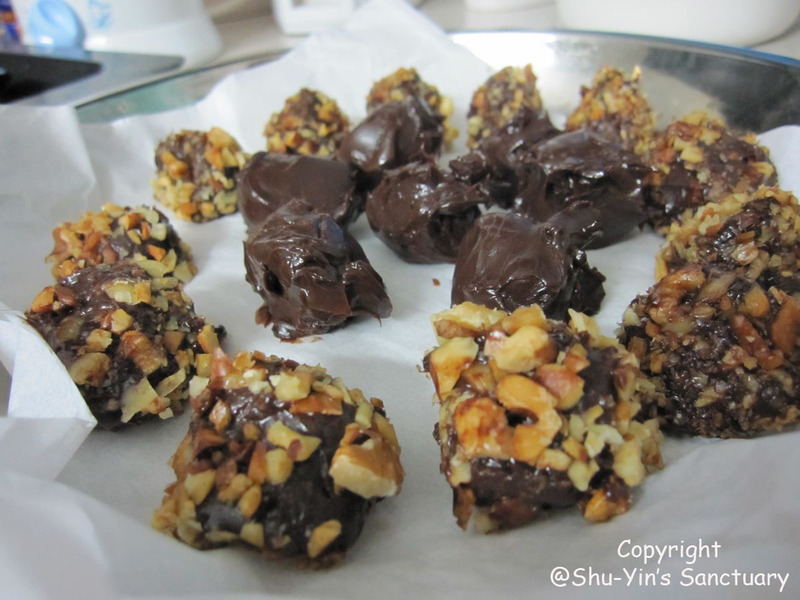 Remove the truffle mixture from the refrigerator. With your hands, or else a melon baller or small spoon form the chocolate into round or mis-shaped bite-sized balls. Immediately roll the truffle in the coating and place on a parchment lined baking sheet or tray. Cover and place in the refrigerator until firm. Truffles can be refrigerated for a couple of weeks or else frozen for a couple of months. Bring to room temperature before serving. Preheat oven to 350 degrees F (177 degrees C) and bake nuts (pecans, walnuts or almonds) about 8 - 10 minutes or until brown and fragrant. For hazelnuts toast about 15 minutes or until the skins start to blister. Remove from oven and roll in a clean dish towel. Let the nuts 'steam' for about 5 minutes and then remove the skins. Once the nuts have cooled, chop coarsely. this recipe only need fridge right?? if yes then can i have recipe too i wanna try! !